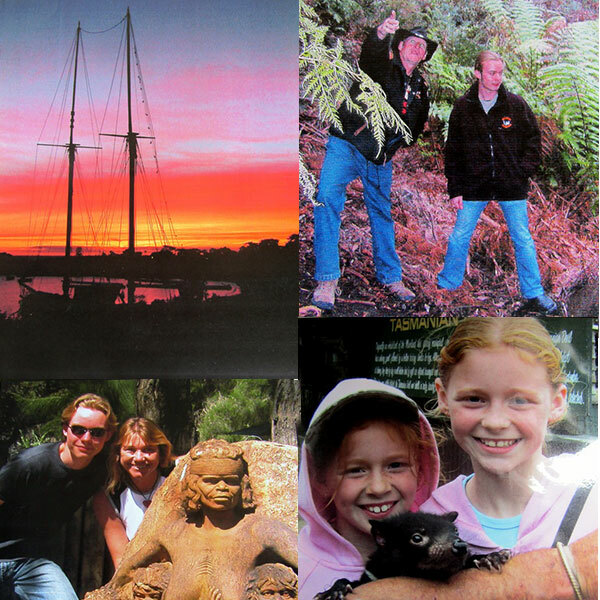 2004 was the year for us we finally shifted to Tasmania, the land of our dreams. We went on holidays the year before and fell in love with the island and its inhabitants. If you think Tassie people have two heads, think again or better follow my story because I will prove everyone wrong, Tassie is awesome! If they have two heads they certainly have two brains as well! This story started like a fairytale. We went on our honeymoon to Tasmania and slowly explored the island. Driving on tiny country roads with animals all over the pastures, and later at night on the roads as well. It made a great impression on us. Every Aussie girl or boy would have heard the stories at school about Abel Tasman discovering Tasmania, and my Dutch background made me proud and curious about this great Dutch explorer. Abel Tasman was the first known European explorer to reach the Island of Van Diemens Land, now called Tasmania, in November 1642. On December 3rd 1642, Abel formally claimed possession of the land after he swam through the surf and planted the Dutch flag on the Island. The sea was too rough for the ship to sail ashore so swimming was the best option. On that day Tasmania as we know it now was put on the map. A nice detail...in 2006 when Greg and I managed Hanson Bay Wildlife Sanctuary on Kangaroo Island, South Australia, we met one of Abel Tasman’s great, great, great grandsons named Abel as well! What a small world. I must say that Tasmania is one of the most breathtaking islands I have ever been to and I have visited quite a few. The very first time I visited Tasmania was in 2003 and I was blown away by the beauty of the island. Driving from Davenport to the East Coast, the Island showed the most beautiful sceneries. Grasslands and hilly parts with rock formations and with lots of birds in many varieties swarming over the hundreds of trees. It was time to finally meet the famous East Coast of Tasmania. We drove through a small town called St Mary’s and the first thing we noticed was a girl of about 20 years old sitting on the side of the road on the nature strip. She had more hair on her upper lip than many men on their chin. I immediately thought of the movie Deliverance and almost heard the Banjo’s playing. I sort of wondered what we would stumble onto next. We drove past the girl and turned into Elephant Pass road which would lead us to St Helens. The long and winding road took us higher up the mountain and we were amazed by the amount of dead wallabies and possums on the side of the road. At that stage I had no idea about the amount of animals that lived on Tasmania. We passed the world famous Pancake parlour where I met Crown Prince Frederick and his Tassie wife Mary only a year. A half later after I became a employee at the Parlour. What a day was that, royalty on Elephant Pass and you couldn’t wish for nicer people to come to your establishment. Some story to pass on to your friends and family. Anyway, back to reality. The coastal road took us to St Helens, the capital of the East Coast. A beautiful little town with everything you need for a great holiday, and many people did just that, holidaying around St Helens and the amazing coastline of Tasmania. Fishing, gorgeous beaches and the best thing (well, at least I thought so), hardly any people! If you think about Bondi beach with 30.000 people visiting the beach on a sunny summer's day, I more than prefer Binalong Bay with only a few sun lovers to enjoy the scenery. Binalong Bay has been mentioned in many tourist guides as one of the most beautiful beaches in Australia, and I certainly know why, I fell in love the first time I saw it. Stunning!! It might not come as a total surprise that after our honeymoon we decided we wanted to move to Tasmania to live. We are no talkers, we are doers. And we purchased a home on Elephant Pass called Cloud 9 because it was 600 metres high on the mountain and nearly reached the clouds - on a cloudy day, that is. The property backed onto national forest and had solar power and a nature toilet. The toilet had a drop of about 2 metres in a catch container that had to be changed over every three months so the waste could be used for the garden. Strange idea for some people, recycling your toilet waste, but I must say we grew the most beautiful vegetables I have ever eaten. The toilet was situated on the outside of our house which was built on stilts, and it had a window in the door so you could watch nature whilst you reacted to the call of nature! Now that’s different, isn’t it? There were no neighbours for miles so you didn’t have to worry about people looking in, although when it got dark the Tamar Wallabies came out of hiding to mow the lawns, and they could see in. It was amazing to see hundreds of them around the property, hopping along like Skippy once did on TV. The bath and shower were also on the outside of the house with similar views. We decided it might be a good idea to buy some blinds for the windows in case we had visitors but for us, it was a treat to have a bath with the view like a National Geographic photo in our own backyard. The water came from our own rainforest. Huge ferns as far as you could see, and the Tassie rain that fell on a regular basis went through a layer of coal that filtered the water which we pumped up from the base of the property to the top, and it was gravity fed into the house. Water as pure as water can be. A wood fire warmed the house and the cooking was done on an old-fashioned combustion stove. This house was an eye-opener, for sure. One slight drawback to all this, though. Solar power is great but Tassie also has many rainy and overcast days so we couldn’t really watch any TV because there was not enough electricity. But we were young and just married so who needs TV?? The first week we had a visitor but not the one you would expect. A big, black tiger snake entered the property and tried to wriggle through the fence. Because we had chicken wire on the fence he could only go so far and got stuck and seriously hurt. We couldn’t just leave it there to die so Greg had to be the brave one and chopped his head off. With the body of the snake on one side of the fence and the chopped of head on the other side we managed to survive the “attack”. It was amazing to see that 30 minutes later the head was still moving and the jaws “clapping”. This is the difference between headless and legless. When you are legless well that’s about it, but when you are headless you seem to be going a lot longer. This first snake got Greg interested in these reptiles and later in life he became a real snake catcher and relocated snakes instead of chopping their heads off. The first year on Elephant Pass we started to look for jobs which wasn’t the most easy thing to do. In season there was plenty to do in the tourist sector but in wintertime it was more difficult. I ended up getting a job as a waitress in the Pancake Parlour and Greg went out to become an all terrain vehicle instructor. Together we also went out to Freycinet Vineyards to do some grape picking and pruning. The owner, Claudio Radenti, was a lovely guy who taught us everything we know about wine and winemaking. Claudio made a sparkling wine called Radenti that won many prizes for the best sparkly wine in the wine business. We still have fond memories of our time at Freycinet Vineyard, and we still adore the Radenti sparkly. The trip to Freycinet Vineyard was amazing every day. The coastline of Tasmania on one side of the road, and Tassie pastures on the other. Early in the morning we witnessed the most stunning sunrises you could wish for, the colours so beautiful and breathtaking. Sunset and sunrise were also the times you would see huge amounts of animals as they come out to feed at that time. Kangaroos, wallabies, possums, the odd Tasmanian devil although you were more likely to hear them from the forest, dark coloured echidna’s (the blonde variety you see in warmer areas of Australia) and many different birds as well. The tiger snakes that live on the island you would “meet” on the side of the road after an altercation with one of the many cars that roam the roads of Tassie. To me, it was a bit like a zoo you could visit every day without having to pay, just awesome. The fishermen would be out to do their jobs and many times they would come back with huge amounts of fresh fish like flathead or the big tiger flathead, salmon and crayfish. Greg got me a craypot for Christmas once and we went out to catch our own. Tassie crayfish or even the green New Zealand crayfish would be in our pots and they would weigh as much as 3 or 4 kilos! It is a bit decadent and maybe also a bit over the top but after one crayfish season we were sick of crayfish. I never knew there were so many recipes to cook crayfish. When I do my Christmas shopping at present I always have to smile at the size of the crayfish in the shops, nothing beats the Tassie ones! Tasmania has so many beautiful places to visit it is hard to know where to start. One of my favourite places is Launceston with the Cataract Gorge in the middle. The Aboriginal history of Launceston is an eye opener and very interesting. Hobart with the beautiful port and fishing boats coming in, the rugged North Coast of Tassie, with Burnie as one of the main places. Every little town there has its own story and it is fabulous to see the treasures they hold - you just have to go and keep your eyes open, it will not disappoint you, for sure! Next time you are thinking about a holiday or somewhere else to visit, take my advice and head to Tassie, you will find your own Treasures.